Firefox on Windows is the first desktop browser to support the new WebVR standard (and macOS support is in Nightly!). As the originators of WebVR, Mozilla wanted it to embody the same principles of standardization, openness, and interoperability that are hallmarks of the Web, which is why WebVR works on any device: Vive, Rift, and beyond. To learn more, check out vr.mozilla.org, or dive into A-Frame, an open source framework for building immersive VR experiences on the Web. MDN has great documentation on using ... with object literals or for destructuring assignment, and the TC39 proposal also provides a concise overview of this feature. Over in DevTools, the Network panel now supports filtering results with queries like “status-code:200“. There are also new, optional columns for cookies, protocol, scheme, and more that can be hidden or shown inside the Network panel, as seen in the screenshot above. New installations of Firefox on Windows will now default to the more stable and secure 64-bit version. Existing installations will upgrade to 64-bit with our next release, Firefox 56. Restoring a session or restarting Firefox with many tabs open is now an order of magnitude faster. For reasons unknown, Dietrich Ayala has a Firefox profile with 1,691 open tabs. With Firefox 54, starting up his instance of Firefox took 300 seconds and 2 GB of memory. Today, with Firefox 55, it takes just 15 seconds and 0.5 GB of memory. This improvement is primarily thanks to the tireless work of an external contributor, Kevin Jones, who virtually eliminated the fixed costs associated with restoring tabs. 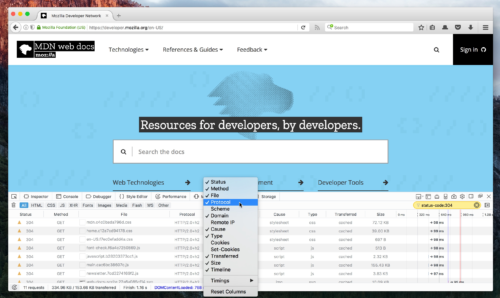 Users can now adjust Firefox’s number of content processes from within Preferences. Multiple content processes debuted in Firefox 54, and allow Firefox to take better advantage of modern, multi-core CPUs, while still being respectful of RAM utilization. Firefox now uses its built-in Tracking Protection lists to identify and throttle tracking scripts running in background pages. After a short grace period, Firefox will increase the minimum setInterval or setTimeout for callbacks scheduled by tracking scripts to 10 seconds while the tab is in the background. This is in addition to our usual 1 second throttling for background tabs, and helps ensure that unused tabs can’t invisibly ruin performance or battery life. Of course, tabs that are playing audio or video are not throttled, so music in a background tab won’t stutter. With the announcement of Flash’s end of life, and in coordination with Microsoft and Google, Firefox 55 now requires users to explicitly click to activate Flash on web pages as we work together toward completely removing Flash from the Web platform in 2020. The IntersectionObserver API allows the browser to respond to the visibility of elements on a page far more efficiently and reliably than existing hacks with polling or invisible Flash movies. You can read more in my article on IntersectionObserver from last week. See the Pen Hello IntersectionObserver by Dan Callahan (@callahad) on CodePen. The requestIdleCallback() API offers a new way to schedule callbacks whenever the browser has a few extra, unused milliseconds between frames, or whenever a maximum timeout has elapsed. This makes it possible to squeeze work into the margins where the browser would otherwise be idle, and to defer lower priority work while the browser is busy. Using this API requires a bit of finesse, but MDN has great documentation on how to use requestIdleCallback() effectively. Geolocation and Storage join the ranks of powerful APIs like Service Workers that are only allowed on secure, https:// origins. If your site needs a TLS certificate, consider Let’s Encrypt: a completely free, automated, and non-profit Certificate Authority. Additionally, Firefox 55 will not allow plug-ins to load from or on non-HTTP/S schemes, such as file:. Replace the new tab page and modify the browser’s search engine. Request and inspect permissions that they have been granted. Opt-in to the browser’s native styling via the browser_styles manifest property on sidebars, action menus, and more. There are many more changes in the works as we get ready for the next era of Firefox in November. Some users of Firefox 55 will begin seeing our new Firefox Screenshots feature, the Bookmarks / History sidebar can now be docked on either side of the browser, and we just announced three new Test Pilot experiments. For a complete overview of what’s new, refer to the official Release Notes, MDN’s Firefox 55 for Developers, and the Mozilla Blog announcement . Oh… VRML is coming back! I already have Firefox 56.01b. Doesn’t that make 55 an older, and less-advanced, version?—-or am I missing something? Firefox 56, which you have, is currently our Beta version. My new Apple MacOSSierra overheats regularly and the message says it’s due to Firefox. Is this an apple of Firefox problem and what can I do about it. I’m still a computer novice but have used Mozilla for many years (suggested by me son) so I’m not sure what to do? Will the new update fix this problem? Thank you for using Firefox. We’re focusing a lot of effort on improving Firefox’s performance and efficiency, so each new update should be better than the last. That said, you shouldn’t be seeing warnings like that. Consider refreshing Firefox to see if there’s an add-on or setting that’s causing problems. That’s possibly nice, but does firefox supports alsa on linux ? can we still use our beloved extensions such as firebug, tab groups, tree style tabs, classic theme restorer, etc. ? This topic has been covered extensively elsewhere, especially the Add-ons Blog. The new add-ons APIs coming with Firefox 57 in November will not allow for arbitrary UI customizations like Classic Theme Restorer. However, an API that will make Tab Groups possible is in the works, and Tree Style Tabs are possible with the current APIs, though the add-on will need to be adapted to the new APIs. These little changes may be nice, but they’re all trivial compared to the coming apocalypse that Moz is planning for FF 57. When they wipe out almost their entire extensions ecosystem — which is the main reason the few remaining FF users are still hanging around — the entire browser is going to fall from the tree like a rotten fruit and shplat onto the ground. And the Chrome beast (that Moz has pitifully been trying to imitate) will be standing by to lick up the remains. I work in IT and I can tell you Chrome picked up many users in the past couple years, but it is the browser of choice of average/inexperienced users. When you ask them why they choose it, you don’t really get good answers, mostly because it’s from Google. It’s not a bad browser but there are several reasons why Firefox is better. And I’m not even including the personal data hoarding. I’ve already found replacement extensions to the few I have that are not getting updated for FF 57, and the rest are all have been updated or have a beta/RC version out, that supports the new extension-API. Just got upgrade on linux to FF55 with all promises of VR. I know you are excited about this, but experience on linux is = 0.
except nice videos showing all sorts of VR fun actual browser renders exactly NOTHING. I run and need to remain with Firefox 32bit. Will Mozilla continue to offer & support Firefox 32bit regular release channel upon Firefox 56 release. Presume, my 32bit will be forced to 64bit. Will Firefox ESR continue to offer & support 32 bit. Some suggestions about search experience – “Just type your query, and then click which search engine you’d like to use.”. But there is a problem with autocomplete. My default SE is google.I want to search sth in bing. If I type sth I get suggestions from google.So I want to select my SE – bing, then type sth to get suggestions from bing and then search. Second problem – there is no icon of active SE. Maybe use icon instead of magnifying glass. Third problem – previously used SE should be automatically made as default after search. Example: My default SE is google, I search sth in wikipedia. Next time if I want to search sth in wikipedia I have to select its icon again, because google is default. Every time RMB clicking and “set as default SE” is not an option. Oh no! That shouldn’t be happening. Have you tried refreshing Firefox?